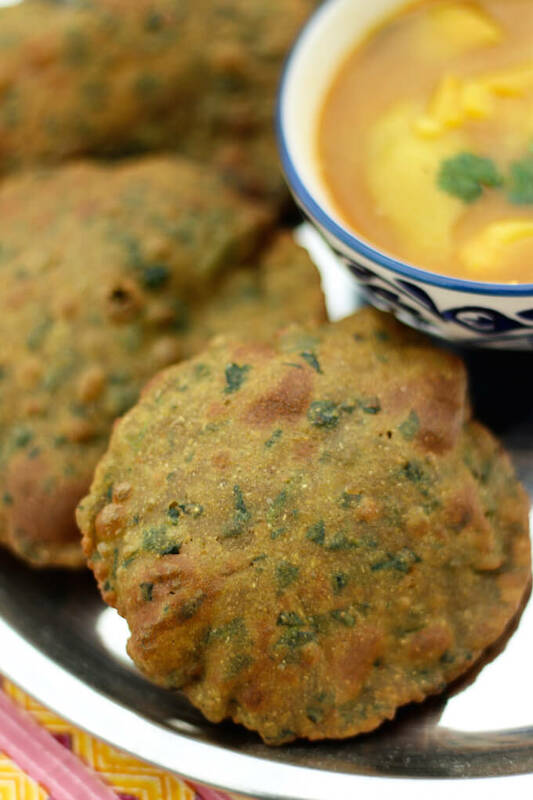 Bajra Methi Puri is a traditional winter recipe from Rajasthani cuisine. Made with bajra (pearl millet) flour and fresh methi (fenugreek leaves), it is a delicious and healthy. Pair it with a curry for a complete meal or enjoy them as on their own as a tasty millet snack. Bajra Methi Puri – a winter delight! Both Bajra (pearl millet) and methi (fenugreek) are winter crops and Bajra-methi is a popular preparation during these months in many Indian homes esp in Rajasthan and Gujarat where bajra grows in plenty. In fact, long before supermarkets, bajra flour was only available during winters after the crop was harvested. When we were kids we used to feast on rustic, coarse Bajra rotis in the winters. In summers it used to be jowar roti. Jowar or sorghum millet keeps the body cool. Puri is a deep fried, puffed Indian bread, usually made with wheat flour but slowly millet flours are increasingly being used for bread. 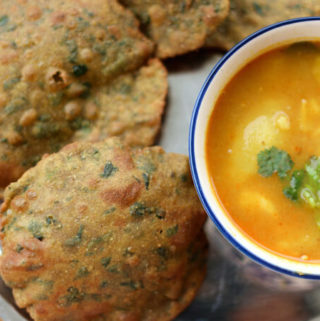 Although these puris are deep-fried, the addition of methi and bajra flour makes them a healthier choice. Bajra has many health benefits and makes a tasty alternative to wheat flour for Indian breads. It also doesn’t absorb as much oil as wheat when frying. In this methi bajra poori recipe, I have used a mix of pearl millet flour and whole wheat flour. Whole wheat flour makes it easier to roll the puris but you can go completely gluten-free by omitting the wheat. Bajra Methi Puri is crispy, delicious and great for breakfast, brunch or snack! 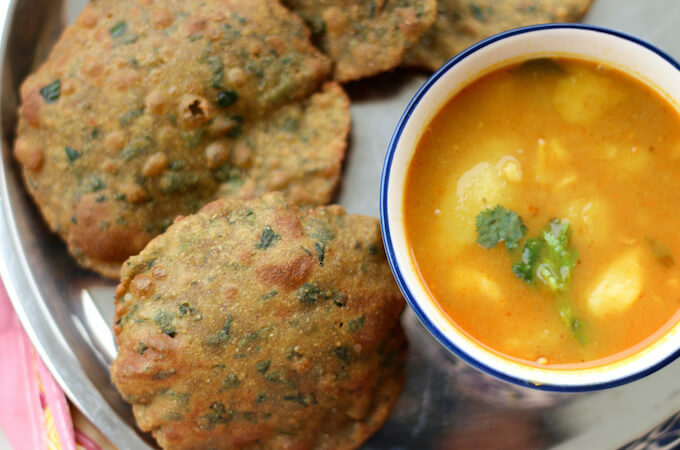 Winter holidays are especially lazy and these bajra methi puris are perfect for family brunch. Just the memory of the meal as I write this is making me hungry and crave for some warm pooris. Imagine hot puffed up puri coming straight out of the wok and into your plate. We often ate the leftover puris as tea-time snacks. The puri itself has so much flavor because of all the spices in the dough that you can eat them just like that, without any curry. I love the earthy, rustic texture and flavor that bajra adds. Methi or fenugreek leaves have a slightly salty and bitter taste and they go great in this recipe. Not just in puri, methi can be added to many savoury bread recipes. “Mum’s Cooking”, here I come! When I was boarding my flight to India, a couple of days back, mummy asked what is it that I want to eat and Bajra Methi Puri with her signature aloo ki sabzi is first on my list. Isn’t it amazing to be pampered by your parents long after you have flown from the nest! 🙂 As I was walking the aerobridge an ING advert said: “mum’s cooking, here I come”. It just rang so true for me at that moment. I quite look forward to going back to India in winters because of the variety of foods. Seasonal vegetables are at their peak during winters and so many leafy greens like fenugreek, spinach, colocassia leaves, mustard leaves, and so many more! I also have my special vegetable vendor who updates me on all the latest gossip of the town every time I am there! Love these little interactions and informal relationship that form and are sustained only in small towns these days. In big cities, the supermarkets have kind of killed these old habits. 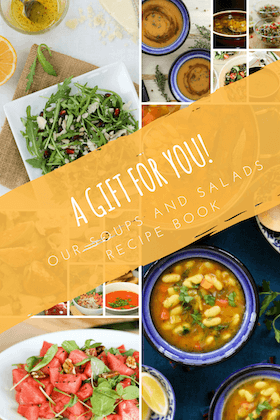 I love how recipes bring back such memories and connections! If you like this recipe, please take a moment to rate it and/or leave your comments at the end of the blog. It will really encourage me to keep exploring, learning and improving. This bajra-methi Puri recipe is simple with bajra (pearl millet) flour, fresh fenugreek leaves and spices. Puris are deep fried puffed Indian bread enjoyed as a snack or a main with a curry. Bajra and fenugreek both are winter crops, making this the perfect seasonal recipe. Omit the whole wheat flour for a gluten-free bread. In a mixing bowl, add all the ingredients, except for oil. Using your fingers mix everything together. Since fenugreek leaves are wet, they tend to stick together so I prefer mixing the dry ingredients well before kneading them into a dough. Using warm water, knead the flour mixture into a tight dough. Be careful to add water little by little. Cover and keep aside for 10-15 minutes. Divide the dough into small lime size balls. Heat oil in a deep kadhai/wok. Roll each bajra dough ball into an approx 4” circle. Use a plastic sheet (the same way as in Bajra roti recipe). I couldn’t get all my Puris to be perfect circles which is fine as they taste perfect no matter what the shape! Carefully put each rolled Puri into the hot oil and fry till it puffs up and is golden brown on both sides. Remove on an absorbent kitchen towel to soak excess oil. Serve hot with your favourite curry. Use only bajra/ pearl millet flour for a completely gluten-free Puri. If you find it difficult to roll, it maybe because the dough is too soft. Add a little more flour to the dough. You can also use dried fenugreek in the recipe and/or other green leafy vegetable. 2 tsp salt seems a lot I cut it down to 1 tsp still a bit on the salty side. Next time I’ll use 3/4 tsp, I added little chopped dill too.overall nice puris. Thanks, Shaheda! I am so glad you tried and liked the recipe. Since we normally eat these puris on their own as a snack too, I have a slightly higher amount of salt in there.. but usually salt is definitely up to everyone’s taste. Dill would be a great addition too. It will add a nice freshness to the puris. Have you tried my dill lentil curry? I love the freshness and aroma dill adds to the dal. They look yummy and are heathy! A bit of hing (asafoetida) can also be added for flavor and benefits. Yes, a pinch of hing would definitely add a lot of benefits and subtle flavor to the recipe. Will surely add it the next time! These puris turned out very tasty.When hot can be eaten plain as a snack and needs no accompaniment. I am so glad you loved them and yes, with all those spices, they definitely can be eaten plain as a snack!